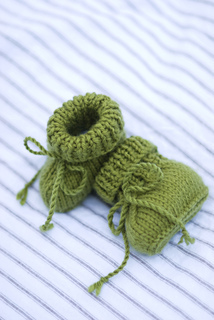 Karen Alfke adapted these cuties from a Swedish bootie pattern her mother used when the kids were tiny. The ribbed cuff and tie help them stay on even the most active of little feet. The pattern is written for your choice of three gauges, so you can use just about any yarn you like! Little ties slipped through a row of eyelets keep these booties on, even during a good kick! We like the simplicity of twisted cord or crocheted chain ties but you can embellish them with beautiful ribbons to bump up the “awwww” factor at baby showers. Whatever kind of ties you choose, be sure they’re attached securely for baby’s safety.